Simply the Best Wedding Band in Israel. We play the music that YOU! want. For the most unforgettable day of your life! 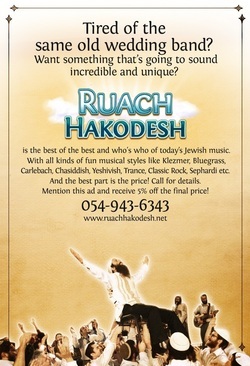 Ruach Hakodesh Orchestra combines some of the best players of religious music, with the widest variety of style. Spiritual content of the music is based on the joy of true Jewish music, in the tradition of Rabbi Shlomo Carlebach, as well as the classic Klezmer, Chassidish (breslov , chabad etc. ) Sefardi and Yeshivish styles, with a twist of Celtic, Jazz, Funk, Reggae, Bluegrass and Trance. Special requests and original songs, are always coordinated with the bride and groom and / or their relatives and friends before the wedding. Have you seen our ad in the Newcomer's Guide? Have you had Ruach Hakodesh lately?